Since its beginnings in 1808, seven successive generations have led to one of the most beautiful domains in the Rhône Valley. 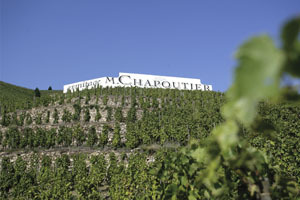 M. CHAPOUTIER has progressively expanded and diversified into the best terroirs of the following appellations: Hermitage, Crozes-Hermitage, Saint-Joseph, Ardèche, Côte-Rôtie, Condrieu, Châteauneuf-du-Pape, Banyuls, and Roussillon. Michel Chapoutier retook the reins of this independent family business in 1990, continuing to expand into other regions of France and into the “New World” countries, Australia in particular. A fervent defender of terroir, Michel Chapoutier has converted the entirety of the domain to biodynamic vineyards. His initiatives also led to the first braille labels and the “Best Sommelier Student of Wines and Spirits in France” competition (Meilleur Elève Sommelier en Vins et Spiritueux de France).